OH WOW! I can’t even begin to explain how I feel right now. First, to have the gorgeous Denver Botanic Gardens as a venue for us was astounding, especially when we are showing alongside of a fabulous presentation of Henry Moore sculptures. Second, it was two of those Colorado fall days—not a cloud in the turquoise sky, and snow clad mountains in the distance, while Denver was a balmy 70 degrees. And then, add 25 spectacular tables filled with glowing and colorful baubles. 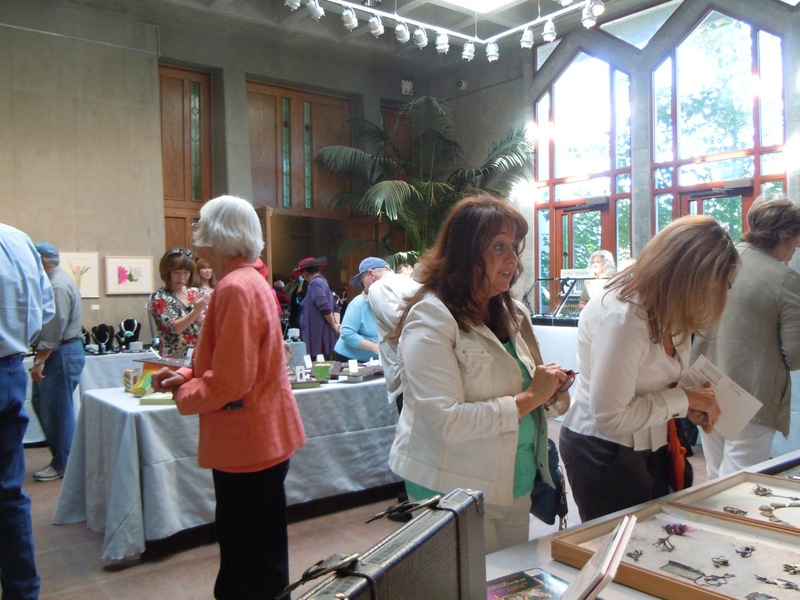 OK, now you have a picture of our First Jewelry Show at the Denver Botanic Gardens. We were inside Gates Courtyard, with full picture windows and tall glass doors behind us. It was spectacular. Just as much fun was looking at the individual diplays of each artist. Harold O’Connor’s display was elegant and sparse, with trays lined with white Japanese paper, which showed off Harold’s exquisite craftsmanship to a “T”. His newest collection, “From My Backyard” was composed of artistically cast elegant rings and pendants of twigs, string and unusual pods he found in his Salida, Colorado yard. Exquisite Spectrolite from Finland accented several of his pieces. It was such an honor to show alongside of one of the True Masters of Metalsmiting in the world. 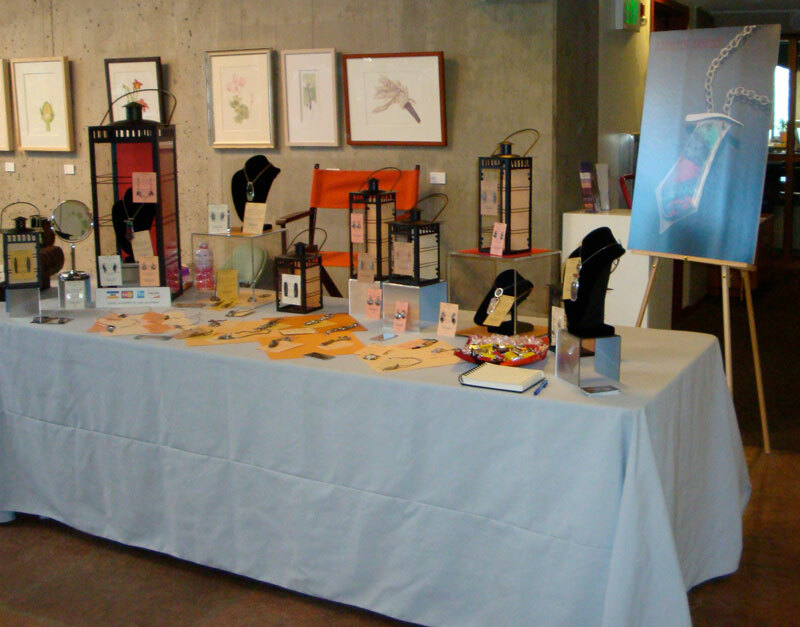 Kathleen Krucoff had a stunning display of lanterns, which showed off her earrings and pendants. 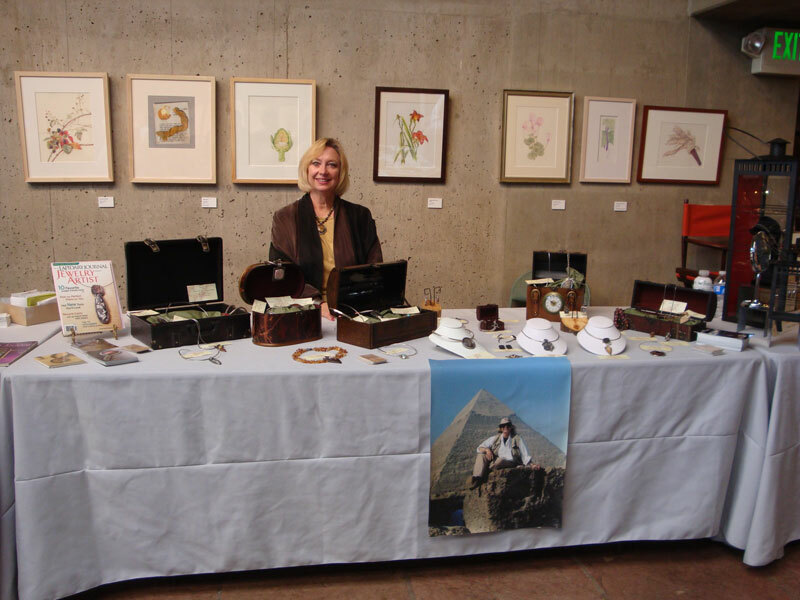 For my usual art festival display, I dress in my archaeology gear, and have trowels and archaeology tools in my display cabinets. But for this truly upscale show I had a collection of “antique” suitcases, from which spilled my treasures, and I forewent my archaeology khakis. Since it kind of went along with my adventure and travel themes, I was happy with my display. For weeks before the show I had nightmares that here we were all at the Botanic Gardens, all dressed up and just standing around visiting with each other because no one came in to see our jewelry. Well, nothing could have been farther from the truth. We opened at 9 on Saturday morning, and our first customers started arriving at 9:27. By 10:00 we were having a light stream of customers, and by 11, we were constantly busy. Jennie Milner said that she didn’t expect it to be like a cocktail party. There was a constant flow of new people. The wine and music started at 1:00, and there was not a moment to stop after that. 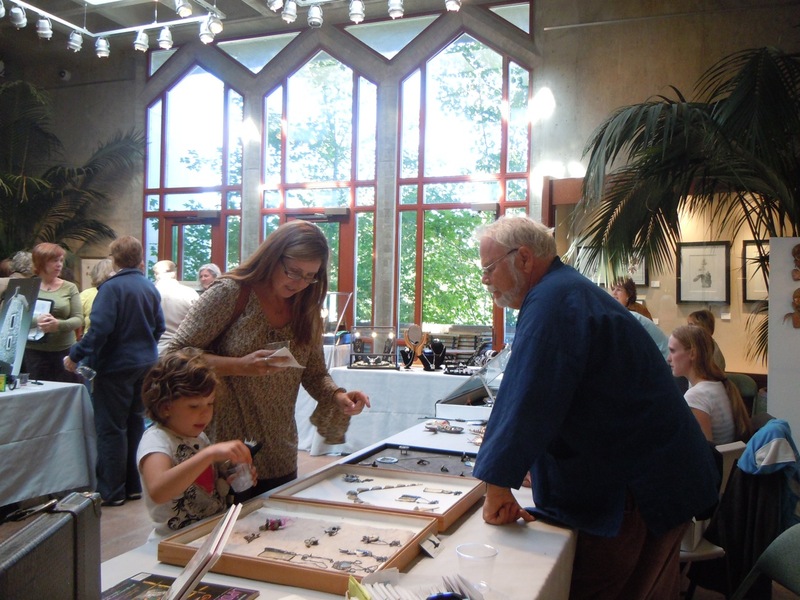 Sales were brisk, and there were lots of questions about our jewelry, the artists, and Colorado Metalsmithing Association. We were packed with customers who were actually buying, not just “thinking about it”. Customers returned to tables several times to make their final choices. Gallery owners talked to many participants about showing in their galleries, and the jewelry market seems to be returning. It was a joy to watch everyone. It was so great to see so many of you COMA members and friends, and I really appreciate each of you for coming out. And in addition to that, it was great to sell so much jewelry. As artists we felt validated and appreciative that so many of you like our work well enough to purchase and wear it. We are truly honored. I have already started plans for next year’s show. New ideas are flowing, and I want to start drawing in my sketch book right now. But my precious 4-year old grandson is spending the week with me as his mom and dad return to Austin and pack and move back to Denver. I am thrilled. They will live nearby, and I don’t have to make that 1100 mile trek down to Texas 4 times a year! They are just as exited to be returning to Colorado. So to each of you, I had a vision. I acted upon it and didn’t let anything stop me. The Denver Botanic Gardens Show was the result of that dream. So follow your dream, follow your passions. Were there some nay-sayers? Oh yeah. And one really hurt my feelings. But I knew in my heart that this would be a hit, and with the talent we have in Colorado, this would be a stunning show. I want to thank Harold O’Connor for the initial inspiration from something that he said about 3 years ago, and I thank my sister, Kathleen Krucoff, for the poster and postcard designs. She made us look beautiful before anything ever happened. 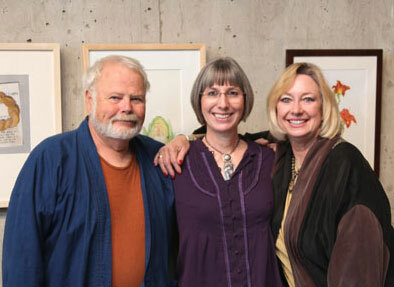 And to the artists and Board of Colorado Metalsmithing Assoc, thank you in letting me, as a new Board member with a dream of where we could go, have free rein in doing what I visioned. To each of you, GO FOR IT! Follow your Passion! And watch this space for updates about our next show.